My primary question is: What is the most efficient and safest way to upgrade to Windows 10 on a Windows 7 domain-joined machine? 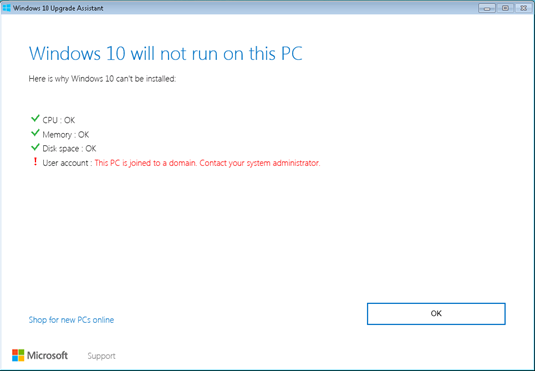 This appears to be an issue with the Windows 10 Upgrade Assistant since early June 2016 (see Reddit or search the web for "Windows 10 upgrade problem: User account: This PC is joined to a domain. Contact your administrator."). Two viable solutions have been proposed 1. Boot from installation media 2. Remove the computer from the domain, then rename the computer, then reboot, then upgrade, then rename the computer again and then add it back to the domain. Both options seem time consuming (previous upgrades have been snappy, seamless, and easy). The added concern with #2 is potentially losing or corrupting the user profile. We do use WSUS and Windows 10 upgrade packages are currently declined. Since many others seem to have the same issue without mentioning it, I am inclined to think this isn't the issue. However, I welcome any comments from others who have used WSUS to push Windows 10 upgrades since early June 2016. I have the same problem! Yesterday I removed the PC from domain, upgrade to Windows 10 , rejoin the domain and the user profile is not back to normal and I had to move everything by hand copying from the old profile. Why Microsoft ???? We removed one of the machines from the WSUS configuration OU, then ran Windows Update so the Get Windows 10 icon in the system tray appeared. Using that icon to upgrade to Windows 10 worked. Windows Domain: how long does it normally take for a user to login to a computer for the first time?